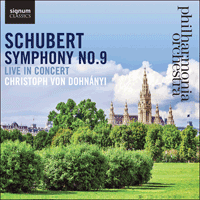 Recorded live at the Royal Festival Hall in October 2015 as part of the Philharmonia Orchestra’s 70th anniversary season, this performance captures the grandeur and intensity of Schubert’s final and greatest symphony. After their sojourn in Linz, Schubert and Vogl moved on in August to ‘the famous, wild watering-place’ of Gastein, a spa high up in the mountains, celebrated for its magnificent waterfall. During the three weeks that they spent there, Schubert wrote the D major Piano Sonata and apparently continued to work on his symphony, before returning to Vienna in the autumn. But no performance of any Schubert symphony is documented for the winter of 1825 and only one further symphony emerged from his pen—the Great C major, apparently in 1828. Since then, many speculative theories have been put forward as to the fate of the so-called ‘Gmunden-Gastein’ symphony of 1825; was it lost, or did the sketches of that summer holiday eventually become the completed C major Symphony three years later? Recent studies have shown the composer’s manuscript of the C major Symphony to have been written on paper made in 1825 or 1826, and a set of parts in the archive of the Gesellschaft der Musikfreunde in Vienna was apparently copied in 1827. Therefore, the symphony was evidently completed well before March 1828. Some sources have claimed that the ‘March 1828’ date is actually a misreading of ‘March 1825’; but that does not explain why Schubert dated the manuscript several months before the holiday during which he worked on the piece. Nevertheless, current musicological thought believes that the ‘Gmunden-Gastein’ symphony and the ‘Great C major’ are one and the same. In the spring of 1828 Schubert offered the symphony to the Gesellschaft der Musikfreunde, but the society turned it down on the grounds that it was too difficult, and accepted the Sixth (the Little C major) instead. Schubert never heard his last symphony performed. On his death in November that year the manuscript passed into the hands of his brother Ferdinand, who had nursed him during his last illness. Ten years later, it was discovered by Robert Schumann, who persuaded Ferdinand to send a copy to Mendelssohn in Leipzig. The symphony finally received its first performance there in 1839, under Mendelssohn’s direction but in a heavily cut version. The major barrier to its general acceptance was its 50-minute length—‘heavenly’, according to Schumann, but then he didn’t have to play it. Orchestral players of the time, especially the strings, found they didn’t possess the necessary stamina to cope with it, and projected performances in Paris in 1842 under Habeneck and in London in 1844 under Mendelssohn were jettisoned owing to players’ protests. When the symphony was finally performed in London under August Manns in 1856, he split it between two concerts, with the first three movements in one concert and the last in the second! Schubert set out to write a ‘grand symphony’ on a Beethovenian scale, which—for a composer of superbly crafted miniatures and a supreme gift for melody—created some problems of form and development. By and large, Schubert solved these by ignoring them. Instead of grappling with uncongenial concepts like counterpoint, Schubert played to his strength, providing momentum through continuous melodic invention, rhythmic drive and long-range harmonic movement. 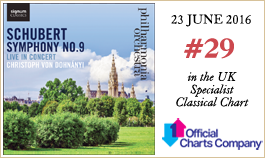 Like so many of his mature masterpieces, the first movement opens with a single, unharmonised line. Several of the piano sonatas, many songs (three in the song-cycle Winterreise alone) and the Unfinished Symphony all open in this way. The main Allegro section contrasts a jerky, dotted rhythm on the strings and repeated triplets on the winds. Rather than follow textbook practice with a contrasted theme in the dominant, Schubert gives us a new theme on the oboes and bassoons in E minor, and then another tune on the trombones (which have plenty to do, for the first time in a classical symphony). The music does eventually reach the expected dominant key, just in time for a repeat of the whole of the exposition. In the development section Schubert again plays to his strength, and the music is driven forwards by restless harmonic shifts, always searching for a new key. But he also finds time to play off the two main rhythmic motifs of the movement, the dotted rhythm and the repeated triplets, and demonstrates how the trombone tune is actually a version of the very opening horn call from the first bars of the slow introduction. It is the horns that usher in the recapitulation, with quiet octave leaps in the dotted rhythm. The recapitulation is an extended affair, and rather than settling for a straightforward restatement of the movement’s themes, Schubert chooses to drive the music onwards with modulation after modulation, referring back to previous thematic material—such as the theme for oboes and bassoons—in a variety of different keys. The trombones’ material comes back again too, to usher in the coda. The last word goes to the very opening horn tune, played fortissimo by the full orchestra. The slow movement begins with another of Schubert’s favourite tricks. The opening phrase for the cellos turns out to be—more or less—the accompaniment to the real main theme, which is heard on the oboe. The movement contrasts this perky march-like theme with characteristically lyrical material. It reaches an almost shockingly intense climax, with horns and trumpets calling to one another across the orchestra, and then disintegrates into a heavenly episode in the major key. The Scherzo is an extrovert, uninhibited waltz, with a contrasting trio of rustic simplicity—perhaps a reminder of that blissful summer spent in the Austrian mountains. The finale is a hell-for-leather tarantella, with more pages of perpetual triplets for the violins and a tune that sounds suspiciously like the Ode to Joy from the last movement of Beethoven’s Ninth Symphony. Perhaps this was a tribute—whether conscious or not—to Schubert’s great musical hero, who died around the time Schubert was writing his own Ninth.